Get your half term started with a bang by coming along to an afternoon of free music activities for young people aged 11- 19 years, on Saturday 20th October at Bridport Youth and Community Centre. From 1-5pm there will be a range of tasters and workshops led by local professionals in the music industry. If you are a budding musician or in a band then this is the perfect opportunity to share musical talent or just have a go. DJ Vince Hook will be offering an introduction to DJing , there will be full band set up and a ‘Pop-up Busk’ ( a bit like an open mic), for those who love to sing there will be an impromptu Pop Up Choir with Hannah Cummings, Bridport Jams will be Jamming if you want to join them, or if you have an interest in recording a demo or sample of your music then pop into the Humph Recording Studio with sound engineer and music producer Harry Warren for a small group or 1-2-1 recording experience. 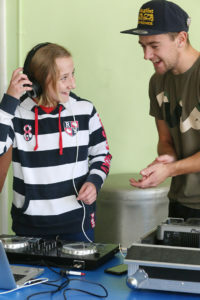 Organised with B Sharp’s new young trainees and volunteers from Bridport, this event is giving young people real life experience of putting together and running a music event. Ellie Walker co – organser said “the open day is suitable to anyone with an interest in playing music or if you would like to talk to us about putting on your own event. Whether you have experience or not, come along and have a go and talk to us. Hotdogs and drinks will be served throughout the afternoon”. Ellie went on to say “ we are grateful to the Dorset Community Foundation for awarding us with an iWill grant to make this project happen, added together with a longer term grant from Youth Music we are excited to be meeting the next generation of musicians, producers and young volunteers. This event is a great way of opening the doors to new young people and in the same vein we are offering free tasters at our weekly music project Bridport Jams which meet every Monday during term time at 6.30pm. If you would like to find out more, get involved, volunteer or take part, please contact info@bsharp.org.uk, call 07947 334138 or just turn up on the day .